Famagusta, situated on the south east coast of Northern Cyprus, is a place where you can really feel the magic of Cyprus’ colourful past; so much so that when you visit you feel as if you can almost reach out and touch the island’s rich history. 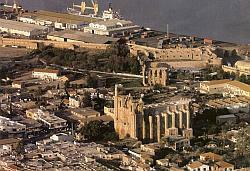 You will also hear and see Famagusta being referred to as Mağosa, Mağusa or Gazimağusa (Gazi meaning unconquered). Once one of the world’s most famous and richest cities when it was under the rule of the Lusignans, Famagusta is also rich in architecture from the Venetian period when it was fortified against the invading Turks. The pretty coastal harbour town of Boğaz is located on the south east coastal road next to the main town of Iskele in North Cyprus. It can be reached from Kyrenia for example by the Gecitkale road via Lefkoşa, you turn left at the coastal junction and then just a few miles afterwards you will find the town as the road narrows as you’re passing through it. Alternatively, for a more scenic journey take the north west coast road from Kyrenia via Esentepe, turning inland at Mersinlik or Kaplıca, and following the signs for Iskele and Boğaz. Boğaz, whilst a small town, is a bustling place and is home to a pretty harbour, some small hotels and b&bs as well as harbour restaurants, with fish obviously playing a large part in the menu on offer at any establishment! 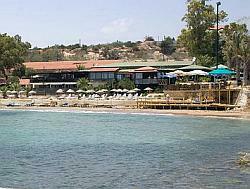 It’s a pleasant place to while away a day, and has some nice little stretches of beach either side of the town to enjoy. The quayside of the harbour is also a busy little place with pleasant well-tended gardens that are a joy to visit. 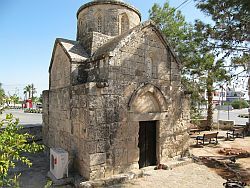 The town of Iskele, (also known as Yeni Iskele or Trikomo), is located on the south east coastal area of Northern Cyprus and on the main road which heads towards the Karpaz Peninsula area. It’s close to the harbour town of Boğaz, which is a very pretty old fishing village that still retains some of its authenticity whilst also being able to accommodate tourism. Iskele can be reached by the Gecitkale road via Lefkoşa, turn left at the coastal junction and after just a few miles you will find the town. Alternatively, for a more scenic journey from Kyrenia, take the north west coast road via Esentepe turning inland at Mersinlik or Kaplıca, following the signs for Iskele and Boğaz.